The Nigerian Field Society visited the prehistoric village of Nok in June last year. 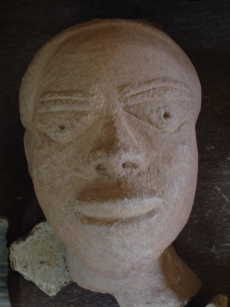 As is widely known, Nok figures date from over two thousand years ago. Click here to see pix of the trip. There's another trip planned for this Saturday. If only the Tourist Development Corporation got its act in order (or private operators), this place would be a gold mine - its the equivalent of Stonehenge for Nigeria. Wow i just loved the pictures from the trip to Nok Village. When I am In Abj in June I will 100% Defo be visiting.. look at those storage urns from 100 of years ago!! It sure is Stonehenge equivalent! Thanks for sharing trully amazing!! I think that local governments should develop tourist sites. It would be a way of ensuring that revenue generated remains in the community. I believe that part of the slow progress in this area is the centralization of Nigeria's tourism strategy.